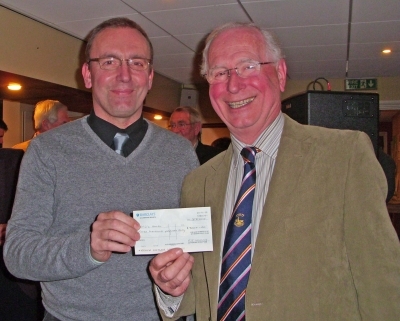 During the prize giving for the St Piran's Day golf Captain Tony Rounsevell had the pleasure of presenting a cheque to Nigel Libby, who along with his wife Julie have founded the charity Ellie's Haven, this year's Captain's charity, whose object is to provide relief to children suffering long term and life limiting illnesses. They have bought an existing property in Treddinick, near Looe for conversion into a holiday haven. So far they have raised over £480,000 towards a target of some £700,000. In thanking the Club Nigel was able to tell us the exciting news that they have just received, from an anonymous trust, a pledge of £100,000 for matched funding which will greatly accelerate them towards their target. It is hoped to start offering holidays in Spring 2015.&#12288; The completed project will cater for up to two families at a time.